Clash Royale is a mobile phone game developed by Supercell, which already attracted millions of players around the world in less than one year. As the game can only be downloaded and played in Android and iOS, and the phone screen is relatively small and unclear, for players who try to have better game experience or show the game scenario to others, a tool is needed to play Clash Royale on PC. The following tutorials show you how to achieve this goal. ApowerMirror is a software which can seamlessly mirror and control Android phone on Windows PC and Mac, it has brief interface but practical function. As you connect the phone and computer via USB cable or Wi-Fi, the software can show all the details on phone screen including games, streaming videos, photos to PC screen simultaneously. What’s more, by clicking mouse and typing keyboard, you can easily play and record Clash Royale on computer. Please follow the steps below and learn how to play Clash Royale on PC. Download and install ApowerMirror to computer. Open it, click “General settings” to preset “Display quality”. Go to Android phone settings and turn on “USB debugging”. 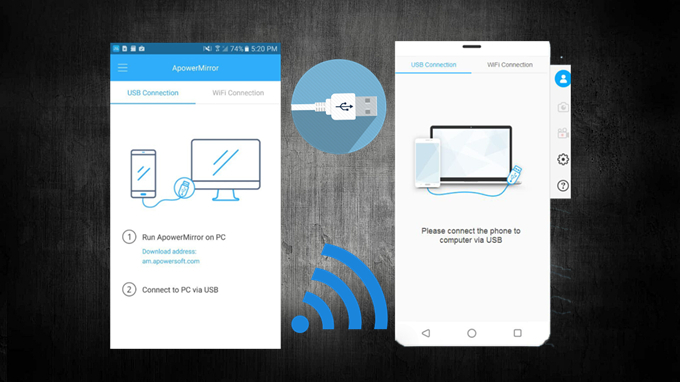 Connect the phone and PC through USB cable, if a window appears and asks allowing for USB debugging, choose “Always allow from this computer”, and then ApowerMirror will be automatically installed to your Android phone. If it fails, please click below button to download and install manually. 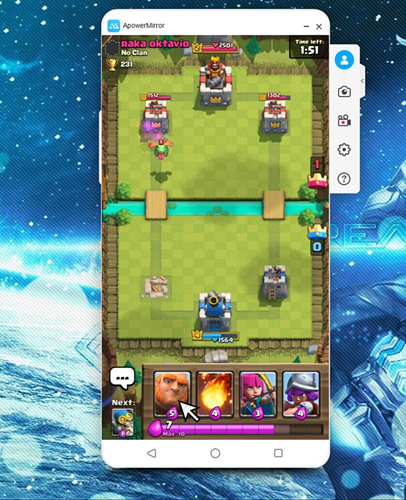 While Android screen is mirroring, you can play Clash Royale and type message on your PC. As you already activated the control function at the first time, if you don’t restart the phone or clean relevant data on the phone, it’s OK to connect phone with computer by Wi-Fi for playing this game on desktop since then. Just keep Android phone and computer under the same network, then open ApowerMirror, click “Mirror” on Android to find and connect computer. Then you can play Clash Royale by PC fluently. To play the game sound on computer, you can mirror the screen by using cast function built in Android phone, or by utilizing Google Home downloaded from Google Play. 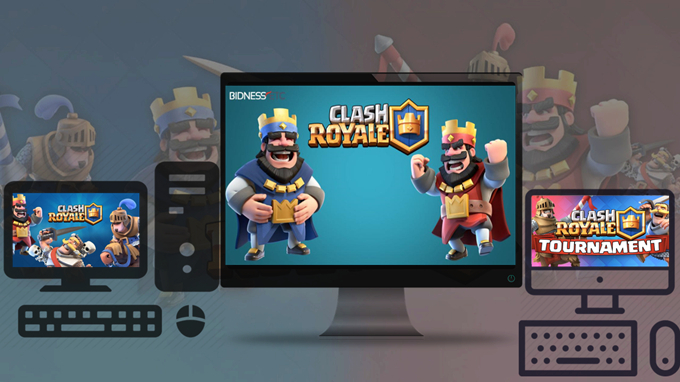 While playing, you can record Clash Royale and take screenshot on computer, the videos and photos will be stored in your computer. The application can only cast iOS device but cannot control it to play Clash Royale on Windows PC and Mac. To mirror iOS device to Windows/Mac, open ApowerMirror on computer, and then use AirPlay on iOS device to find and connect your computer. As the iOS is less open than Android, it’s hard to control iOS directly on desktop, the best way is to install a emulator. The iPadian Emulator is a free tool to simulate iOS device, including iOS interface and function, which enables installation and manipulation of iOS apps on Mac and Windows PC. The following steps show you how to play Clash Royale by this program. Download and install the application on computer. Search and install Clash Royale from App Store. Click to play downloaded apps shown on the main interface. The tool can only simulate iOS system. Except for playing games, it can also run other iOS apps, you can use it to surf internet, send Email, log in Facebook, etc. In conclusion, there are two methods instruct you how to play Clash Royale on Mac and Windows PC, simply control Android phone from computer, or download and play by emulator on computer. It’s your own decision to compare and choose a more satisfying way, please following those steps and enjoy your battle in Clash Royale!